Front view of cartilages of larynx, trachea, and bronchi. A bronchus (plural bronchi, adjective bronchial) is an airway in the respiratory tract of air-breathing vertebrates that branches from the trachea (windpipe) and conducts air to and from the lungs. The bronchus is part of a coordinated system designed to place air in the position where there can be rapid diffusion of oxygen and carbon dioxide with the circulatory system. 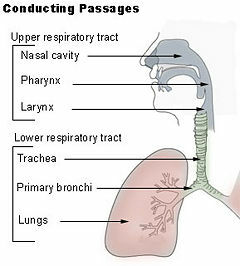 No gas exchange takes place in this part of the respiratory system; however, the bronchi connect with progressively smaller passages until exchange can take place. There are various medical conditions that can occur in the area of the bronchi, including bronchitis, asthma, and foreign body aspiration. The lungs of air-breathing vertebrates have a primary function for the exchange of gases, moving oxygen from the atmosphere into the bloodstream and excreting carbon dioxide from the bloodstream into the atmosphere. The bronchi are part of the airway designed to bring air to and from the lungs. On one side, it connects with the trachea or windpipe, which is a tube that transports air from the larynx (at the vertebral level of C6 in humans) to the bronchi. The bronchus is that caliber of airway in the respiratory tract that then conducts air into the lungs (Maton et al. 1993). It bifurcates into two main branches in mammals, that is, two main bronchi (also mainstem bronchi), the left and the right, at the level of the sternal angle. 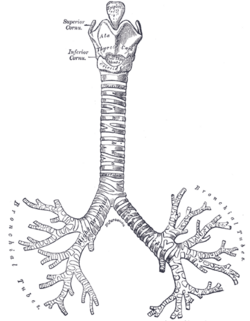 The two main bronchi in mammals (produced by the bifurcation of the trachea) enter the roots of the lungs. The bronchi continue to divide within the lung, and after multiple divisions, give rise to bronchioles. The bronchial tree continues branching until it reaches the level of terminal bronchioles, which lead to alveolar sacs. The latter are made up of clusters of alveoli, which resemble individual grapes within a bunch. Each alveolus is tightly wrapped in blood vessels, and it is here that gas exchange occurs. Deoxygenated blood from the heart is pumped through the pulmonary artery to the lungs, where oxygen diffuses into blood and is exchanged for carbon dioxide in the hemoglobin of the erythrocytes. The right main bronchus (or right primary bronchus or right principal bronchus) of humans is wider, shorter, and more vertical than the left main bronchus. It is about 2.5 centimeters long, and enters the right lung nearly opposite the fifth thoracic vertebra. The left main bronchus (or left primary bronchus, or left principal bronchus), while smaller in caliber, is longer than the right, being nearly 5 centimeters long. It enters the root of the left lung opposite the sixth thoracic vertebra. The bronchi branch into smaller and smaller passageways until they terminate in tiny air sacs called alveoli. The alveolus is the basic anatomical unit of gas exchange in the lung. The azygos vein arches over the right main bronchus from behind; and the right pulmonary artery lies at first below and then in front of it. About 2 centimeters from its commencement, the right main bronchus gives off a branch to the upper lobe of the right lung. This is termed the eparterial branch of the bronchus, because it arises above the right pulmonary artery. The right bronchus now passes below the artery, and is known as the hyparterial branch; it divides into two branches for the middle and lower lobes. The left main bronchus passes beneath the aortic arch, crosses in front of the esophagus, the thoracic duct, and the descending aorta, and has the left pulmonary artery lying at first above, and then in front of it. The left bronchus has no eparterial branch, and therefore, it has been supposed by some that there is no upper lobe to the left lung, but that the so-called upper lobe corresponds to the middle lobe of the right lung. The right main bronchus subdivides into three segmental bronchi while the left main bronchus divides into two. The lobar bronchi divide into tertiary bronchi. Each of the segmental bronchi supplies a bronchopulmonary segment. A bronchopulmonary segment is a division of a lung that is separated from the rest of the lung by a connective tissue septum. This property allows a bronchopulmonary segment to be surgically removed without affecting other segments. There are ten segments per lung, but due to anatomic development, several segmental bronchi in the left lung fuse, giving rise to eight. 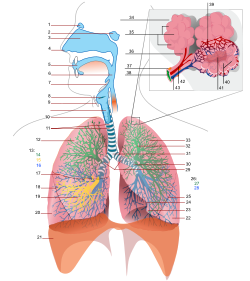 The segmental bronchi divide into many primary bronchioles, which divide into terminal bronchioles, each of which then gives rise to several respiratory bronchioles, which go on to divide into 2 to 11 alveolar ducts. There are 5 or 6 alveolar sacs associated with each alveolar duct. There is hyaline cartilage present in the bronchi, present as irregular rings in the larger bronchi (and not as regular as in the trachea), and as small plates and islands in the smaller bronchi. Smooth muscle is present continuously around the bronchi. The cartilage and mucous membrane of the primary bronchi are similar to that in the trachea. As the branching continues through the bronchial tree, the amount of hyaline cartilage in the walls decreases until it is absent in the smallest bronchioles. As the cartilage decreases, the amount of smooth muscle increases. The mucous membrane also undergoes a transition from ciliated pseudostratified columnar epithelium to simple cuboidal epithelium to simple squamous epithelium. The alveolar ducts and alveoli consist primarily of simple squamous epithelium, which permits rapid diffusion of oxygen and carbon dioxide. Exchange of gases between the air in the lungs and the blood in the capillaries occurs across the walls of the alveolar ducts and alveoli. Bronchitis is defined as inflammation of the bronchi. There are two main types: Acute and chronic. Acute bronchitis is usually caused by viral or bacterial infections. Chronic bronchitis is a form of chronic obstructive pulmonary disease (COPD), usually associated with smoking or long-term exposure to irritants. Asthma is hyperreactivity of the bronchi with an inflammatory component, often in response to allergens. If food, liquids, or foreign bodies are aspirated, they often will lodge in the right mainstem bronchus. Aspiration pneumonia may result. If the endotracheal tube used for intubation is inserted too far, it usually lodges in the right mainstem bronchus. This allows ventilation of the right lung, but leaves the left lung useless. Patients with inadequate cough reflexes may develop chronic right middle lobe lung infections such as the Lady Windermere Syndrome. In the United States, approximately 3,000 deaths occur annually from foreign body aspiration, and of aspirated foreign bodies, about eighty to ninety percent are lodged in the bronchi (Murray 2007). In adults, it is usually the right main bronchus where foreign bodies are lodged, because of its lesser angle of convergence than the left and because of the location of the carina to the left of the midline (Murray 2007). (The carina is a cartilaginous ridge within the trachea that runs anteroposteriorly between the two primary bronchi at the site of the tracheal bifurcation at the lower end of the trachea. According to Chu and Chen (2002), an injury to the airways occurs within 2.5 centimeters of the carina 40–80 percent of the time.) However, there are studies indicating that the lodging of foreign bodies in children occurs with about equal frequencies in the right and left bronchus (Murray 2007). Children under the age of 15 are the most common victims of airway foreign body aspirations, and particularly children one to three years old, with peanuts the most common obstruction (Murray 2007). The lodging of foreign bodies in the bronchus can appear similar to other respiratory conditions, such as asthema, but differs in the presence of unilateral wheezing and decreased breath sounds (Murray 2007). Foreign body removal was performed by bronchotomy until the late 1800s, with the first endoscopic removal occurring in 1897 (Murray 2007). Chu, C.P., and P.P. Chen. 2002. Tracheobronchial injury secondary to blunt chest trauma: Diagnosis and management. Anaesth Intensive Care 30(2): 145–52. Retrieved July 15, 2008. Maton, A., J. Hopkins, C.W. McLaughlin, S. Johnson, M. Quon Warner, D. LaHart, and J.D. Wright. 1993. Human Biology and Health. Englewood Cliffs, NJ: Prentice Hall. ISBN 0139811761. Moore, K.L., and A.F. Dalley. 1999. Clinically Oriented Anatomy, 4th edition. Philadelphia: Lippincott Williams & Wilkins. ISBN 0781759366. Murray, A.D. 2007. Foreign bodies of the airway. eMedicine from WebMD. Retrieved July 15, 2008. This page was last modified on 22 July 2008, at 17:16.